Previous post: It’s Fun to Eat at the Bar! 4:25 am: I’m up before the alarm for my 6:45 am flight. It’s safe to say that happens never. 5:01 am: put on sensible shoes and put suitcase into car. 5:04 am: change sensible shoes and replace with more stylish shoes. 5:54 am: arrive at the airport, park and board shuttle. Meet a fellow foodie. Chat about food. He also makes his own Lemoncello. He uses grain alcohol, not sold in New York, which he procures from a friend in Ohio. I share my Polish potato alcohol and Pisco combination. We chat all the way through the TSA line. 6:13 am: have my ID in one hand, sweater in the other at the front of the line. No boarding pass. Oops. Quickly go backward in line. Obtain boarding pass. Back in TSA line. 6:25 am: My need for coffee supersedes all other things, including boarding a plane. Buy coffee. 6:30 am: entered line as they called my row. No problem. Easy peazy lemon squeezy. 6:35 am: seated next to my new foodie friend. Took my allergy medicine so my very clogged ears would not explode. 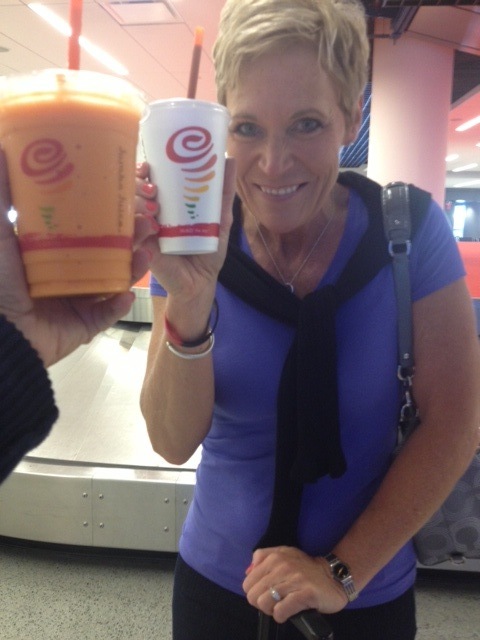 Terri is pretty happy with her Jamba Juice! 8:06 am: Jamba Juice!! I had an Orange Carrot Karma Smoothie and it was good ’til the last slurp. 9:31 am: Penn Station madness…it may be the worst smelling place ever. Only go to the restroom if it is a dire emergency. Trust me on that one. 9:55 am: drop stuff off at hotel on 40th Street. Head to Rockefeller Plaza and Sak’s Fifth Avenue. 10:12 am: stopped for a quick bite and quick sip at Pax. 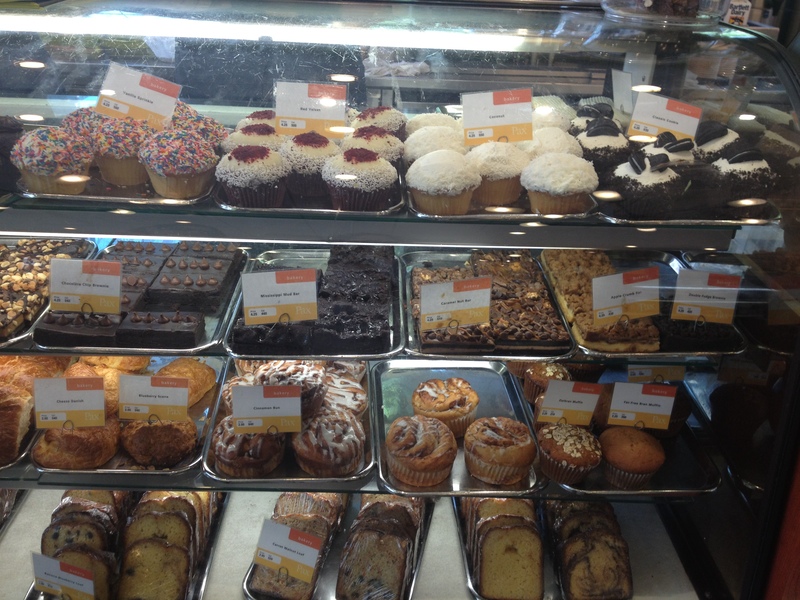 We ordered a few iced lattes and tea along with a lemon bar and red velvet cupcake to share. The quality of the food here is very good but we were disappointed at how dry both our confections were. Brush off the crumbs. Move on. 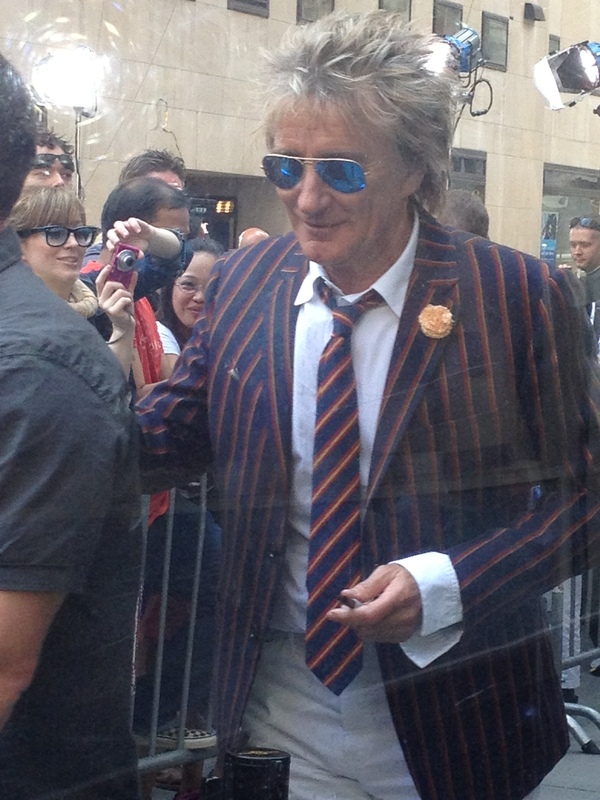 11:34 am: Ran into Rod Stewart. 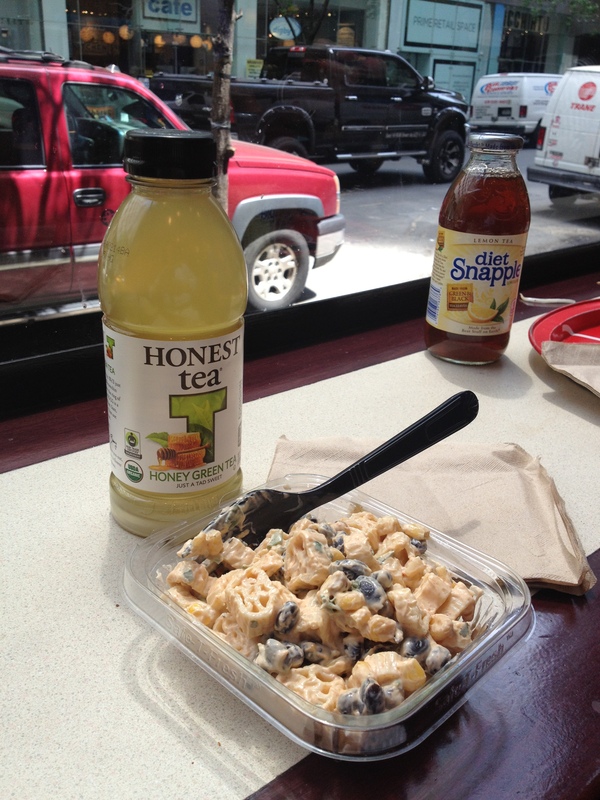 12:30 pm: stopped by Cafe Metro for some Spicy Southwestern Pasta Salad. It had black beans and corn with a creamy mayo. I would have preferred a little less mayo but it was a tasty salad. 1:25 pm: birthday surprise at a Mid-Town Manhattan women’s clothing store. The birthday girl never saw it coming. 1:40 pm: drinks at a restaurant on 7th Avenue in Times Square. I wish I could remember the name so I could tell you not to go. Sorry. 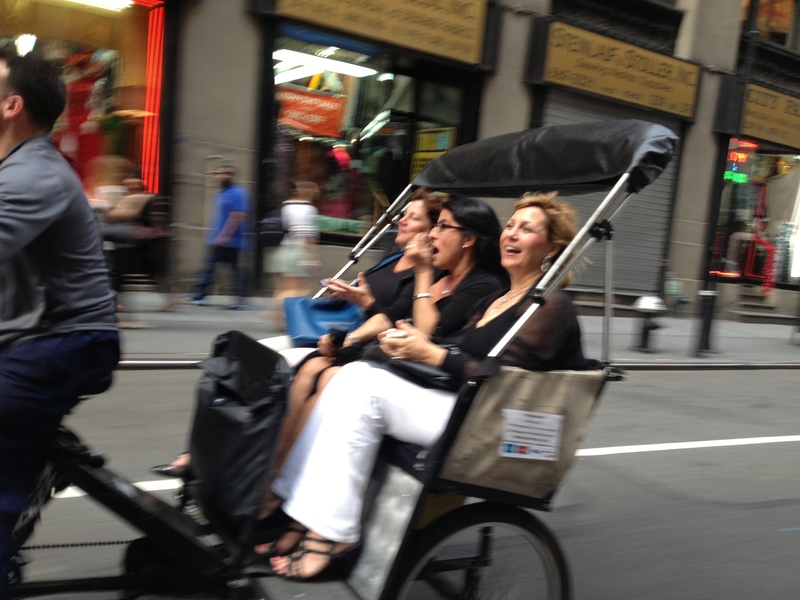 6:00 pm: Pedi-cab ride to 39th Street Pier. BUYER BEWARE: Know/negotiate the price in advance and have cash. 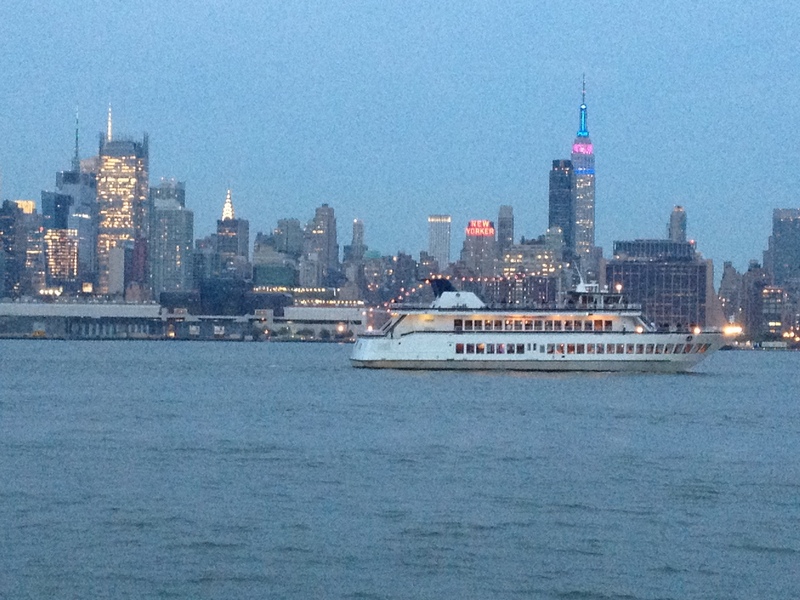 7:10 pm: Ferry to Lincoln Harbor (next to the Lincoln Tunnel) and a short walk to the Chart House. 7:30 pm: arrive and are seated at a curved table with a panoramic view of Manhattan. 7:30 – 10 pm: ate delicious food while staring at one of the most vibrant and exciting cities in the world. I cannot recommend this location more. Be sure to ride the ferry ($17/round trip) if you are capable of walking a bit. Make reservations via Open Table and allow yourself at least two hours. Also, the last ferry leaves around 10:30 pm so be sure to work that into your plan. There are plenty of taxies at the 39th Street station to take you to your destination. 11:15 pm: arrived at the Marriott Marquise Hotel in Times Square. My friend “had a guy” who could get us past the line and up into the rotating dining room for a night cap. Drank a pineapple Caipirinha which probably would have been amazing had I not been up since 4:25 am. 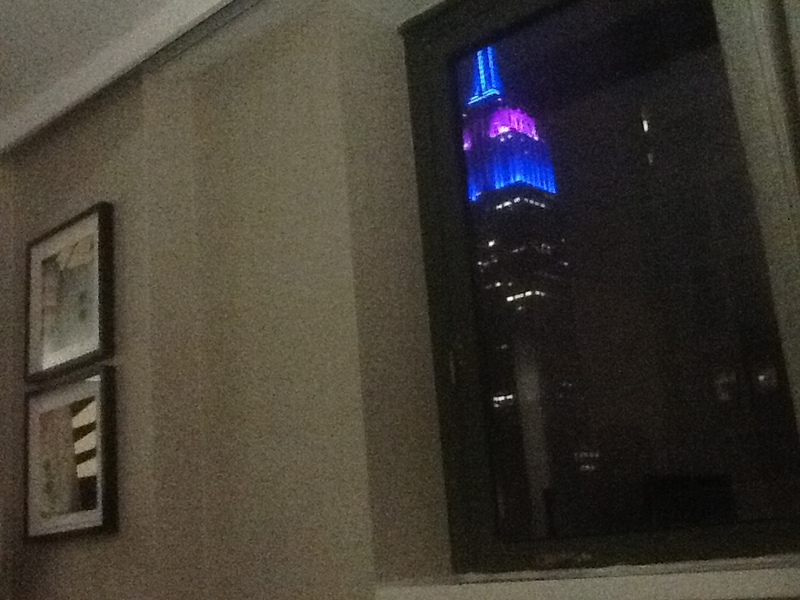 12:45 am: the view of the Empire State Building from my bed. Goodnight world! Cathy, it was a crazy day which was a rolling surprise party for my sister’s birthday. The surprise included two of her high school friends who came up to the city from Washington DC, many modes of transportation and a bit if sipping and eating. It was special and I was excited to share it with everyone.